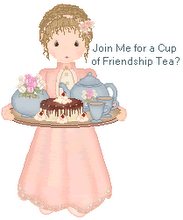 I purchased this pretty Coalport teacup and saucer trio in Burford, England in 2004. I looked in shops in every little town we visited and finally settled on this trio on the last day of that two-week trip. Notice the plate is very small and almost the same size of the saucer. When I questioned a gentleman in a china shop about the size of the tea plate he very adamantly told me in his lovely English accent what I already knew because every English hotel and tearoom I have visited uses this small size plate for afternoon tea. He said, "afternoon tea is not meant to be a meal." 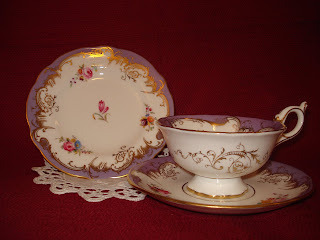 Linda, I also have a Coalport set similar to this and love it. That is a beautiful tea set. You made a wonderful choice. I have four Royal Albert tea cups and saucers that my daughter got me at Harrods when she was in London. I love them and will have to post them soon. Oh my, this is an exceedingly lovely set! I think those golden curlicues are just so very elegant! Enjoyed seeing your beautiful trio and reading your comments on afternoon tea. Your teacup trio is lovely. The details are beautiful. Hope you enjoy it! This is a great post, Linda! And where do you store all these gorgeous cups and saucers? I'll be looking for them, Bernideen!